Dropped off all the work for this Thursday’s show (see previous post for details.) I stayed to help hang everything, and it’s good to see them on someone else’s walls for a change. Hopefully they’ll all go on to another happy home as well. My apartment walls look a little barren so I guess I better get back to work. Here’s the poster for my upcoming one-person art show next week. ARTSPACE is located at 231 E. Main St. in Round Rock, TX (near Austin.) The gallery hours are Thursdays (11-8,) Friday-Sundays (11-6.) 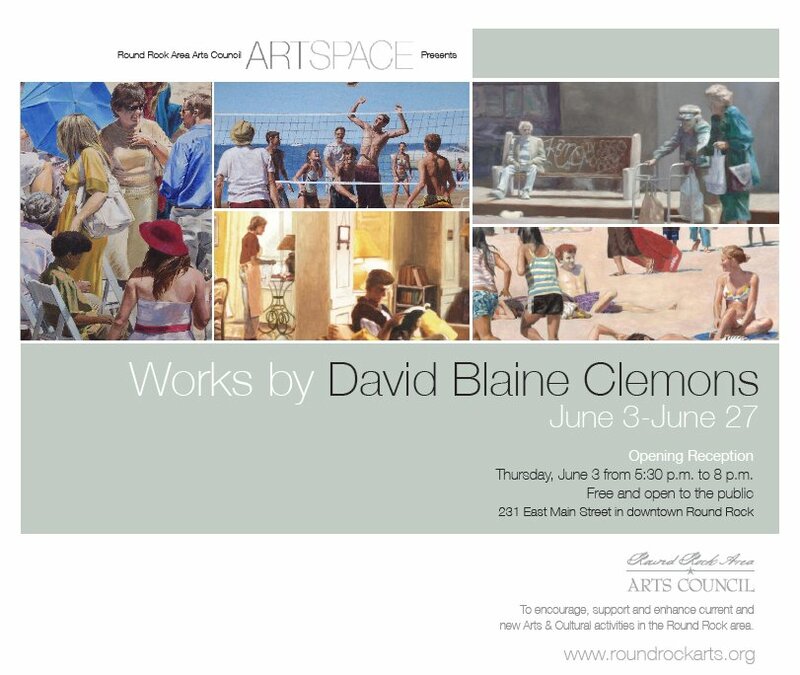 If you’re in the area during the month of June please drop by. All the exhibited works will be available for purchase. Here are a couple recent drawings. Uniball Gelstick on letter size paper. 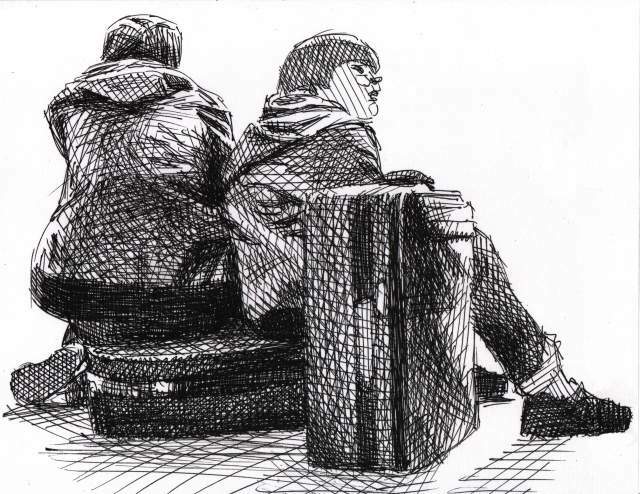 The one of the two kids is from a photo of mine taken at an airport. 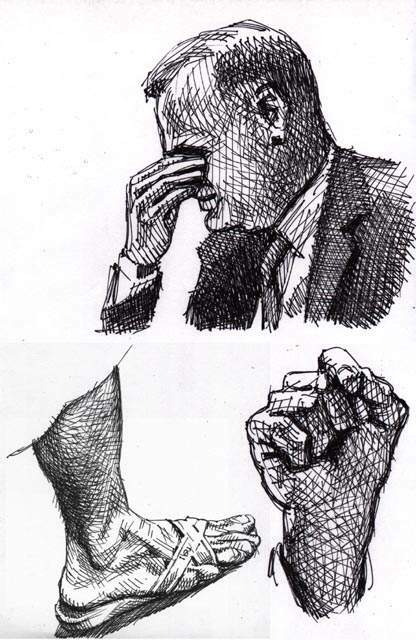 The hand and guy rubbing his eyes were drawn while watching C-SPAN TV. The foot is from a Time magazine photo. I caught this woman at a local cafe recently. 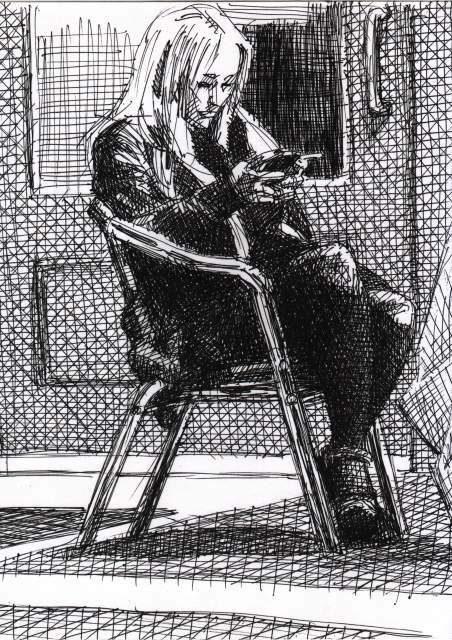 She was engrossed in her text messages which kept her busy enough for me to get her whole figure drawn before she moved anything other than her thumbs. 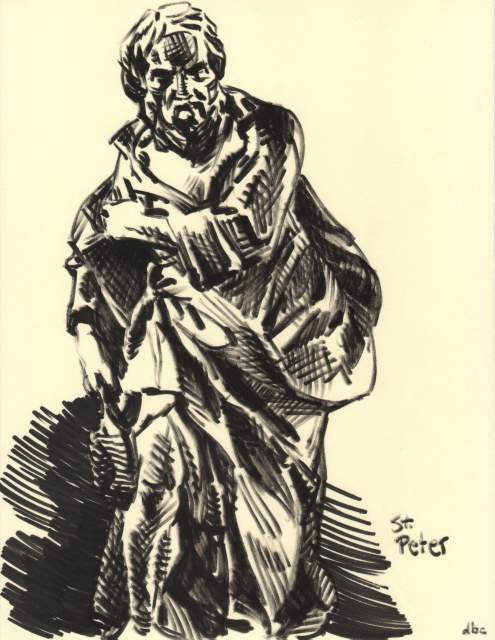 Drawn with a Uniball Gelstick on 8.5×11″ paper. These are a couple recent sketches I made of two clay statues. 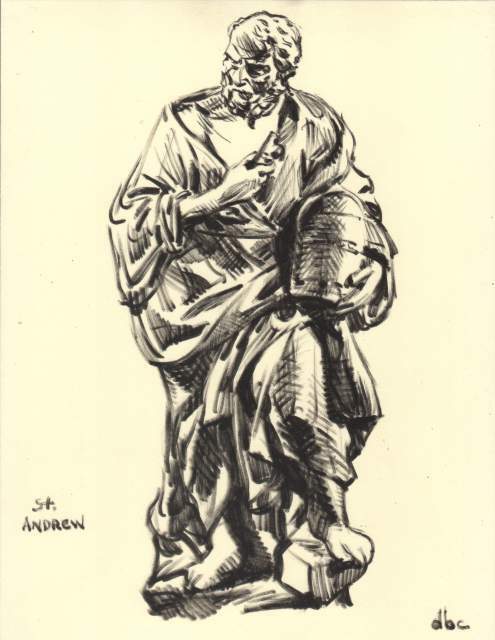 The statues are each about a foot high, and unfortunately the artist was “unknown,” but one was of St. Peter and the other of St. Andrew. The drawings are made with a Pigma Marker Brush on 8.5×11″ tinted rag paper. The book above is the very first one I ever bought, new on the shelves in 1966. 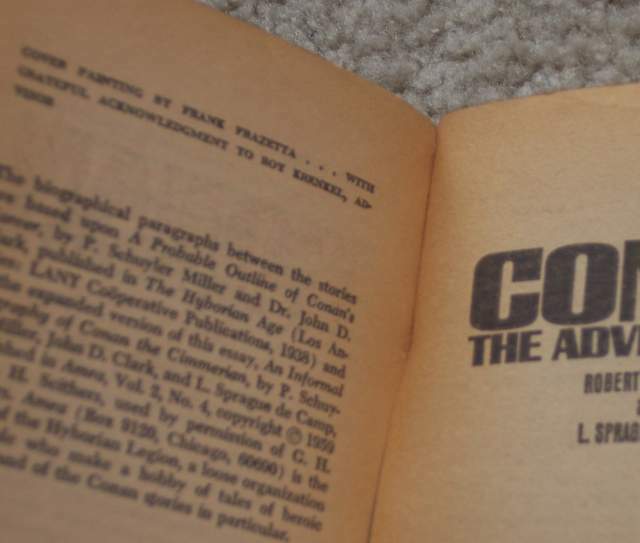 The reason I bought it was because of the cover. 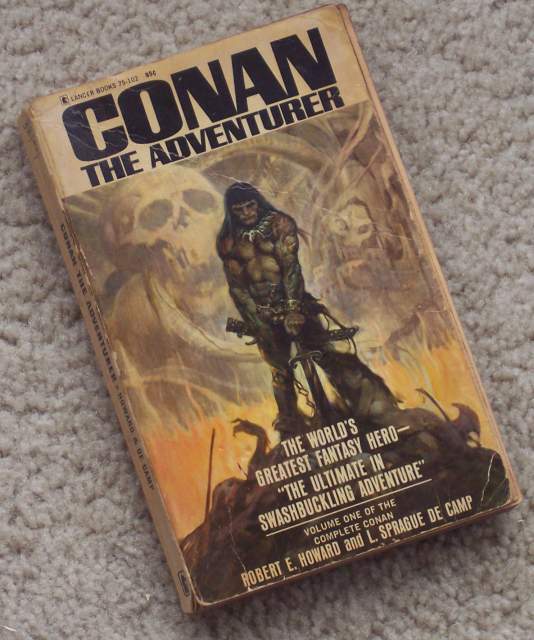 I had no idea who the character was at the time, but I am convinced his resurection was 100% due to the series of covers Frank Frazetta made for them. The inside credits was the first time I had ever seen his name, and I voraciously hunted down everything I could find by him. Fortunately for me, this was a time of Frazetta’s own resurection in print, and he hit the shelves with power that has not been equalled since, becoming a major influence upon artists around the world. Sadly, news has come today that this artist legend has passed away from a stroke. I am heartbroken and literally in tears as I write this, but promise to infuse my work with the same energy today as I felt on the first day I found him. Thank you, sir, for everything. A pleasant surprise greeted me as I walked into the opening for the Live Oak Art Exhibition this afternoon. 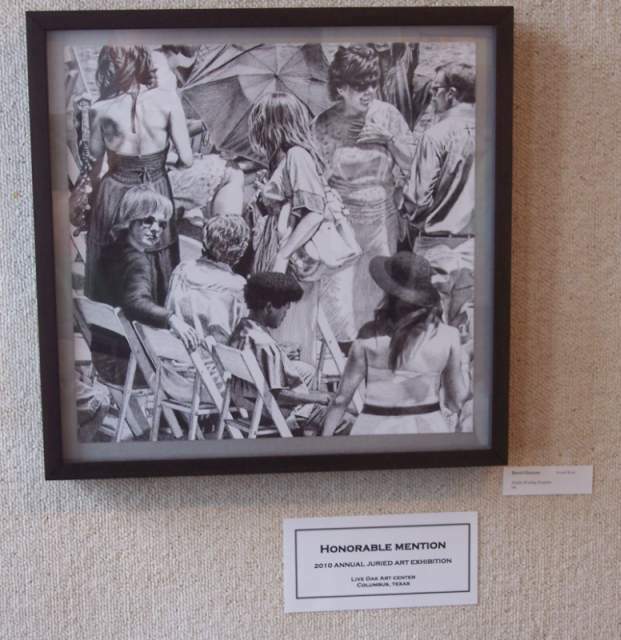 My ink drawing was given an Honorable Mention award! Link to post about drawing in progress. You are currently browsing the Artwork by D. B. Clemons blog archives for May, 2010.